Coronation Crashers? Phoenix’s Last Chance to Stop L.A.
Only one big question mark remains for the Phoenix Coyotes in these playoffs. Do they make good on their last, best shot at redemption at the Staples Center tomorrow night? For Phoenix, Game 2 was Game 7 Overtime. They had a chance to continue their good work, make this a normal, hard fought series, and go into the Staples Center with a wide-open, 1-1 jump ball situation. Instead, they easily played their worst game in five months. It would be unfair to call out a team who had so deftly handled their first two extremely skilled opponents, who had been among the cream of the crop of this year’s playoffs, and who had surprised everybody again and again, for coming up so flat and choosing game #13 of this playoff run to lay their egg. But the results did it for them. In the Conference Final nothing less than perfection is permitted. And against an LA team that has not trailed in a game for over fifteen periods, nothing short of perfection will get the job done. The Los Angeles Kings showed up to Jobing.com to play on Sunday night, and as all pundits who gave them favourite status correctly predicted, their smothering style had the cautious and strategic Coyotes on their heels from opening faceoff. The ‘Yotes were lucky to be at 1-1 after the 1st period in which they were out-shot 16-4, thanks to this Derek Morris bomb from center ice that trended on Twitter (“Shades of Nik Lidstrom” said the aghast commentator). But L.A. didn’t let up, outshooting the Coyotes 44-25, never relinquishing the lead, and getting clutch goals from their top players. Despite this, Phoenix still put up a valiant effort in game 1. Oliver Ekman-Larsson made a beautiful stride to keep the puck in with about four minutes remaining after which Shane Doan was all over the offensive zone and generated three quality scoring chances for himself in the final minutes, during which he scarcely left the ice. But there were no last-minute heroics that night. No game tying goals with the net empty. No overtime. As was the case in all the post-1st round hockey of these playoffs, the victor manhandled their opponent into submission. And no team has been doing more manhandling than the Los Angeles Kings. We all know what happened the next game – no need to re-hash a 4-0 blowout. The only highlights for the burgundy side were that the old Mike Smith rose like a Phoenix from the ashes, and the dark side of Doan emerged with the frustration level. Obviously neither of those things can become trends if the season is to make it past this week. 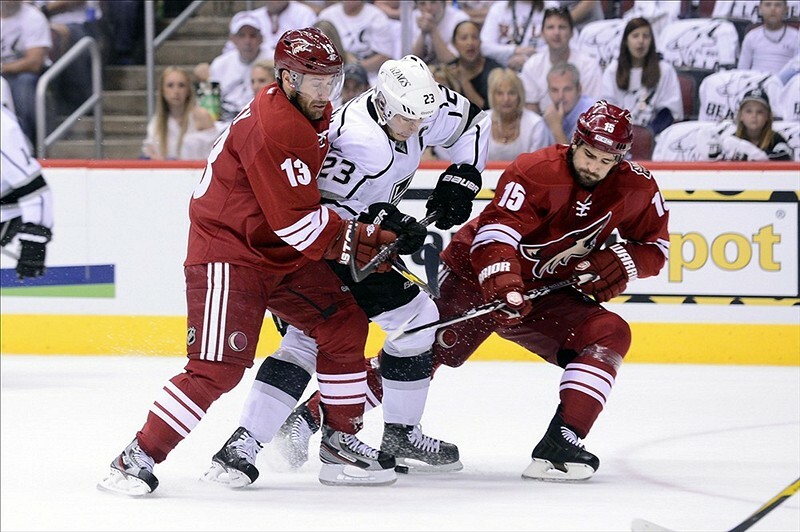 During these playoffs, the ‘Yotes had found themselves in several situations where they should have won to give themselves a strategic advantage. Examples were Game 5 against Chicago and Game 4 against Nashville. Until Game 2 of this series, they had not yet faced elimination or trailed in a series in these playoffs. Yet now it has all turned around very quickly. None of these earlier “should-win” games were do or die situations, and Phoenix mostly seized the opportunities. Tomorrow’s match is also obviously a must-win, and nobody knows better than the Coyotes faithful that it’s the second bona-fide must-win of these playoffs (the first being Tuesday’s Game 2, which they blew). Excuse me for crying wolf on the other occasions and making matches seem like a bigger deal than they were, but this really is for all the marbles on Tuesday. L.A. is 10-1 in these playoffs now. Their confidence and swagger are at an all-time high. They’ve made no mistakes. The last team with this many road wins (9 – Tampa Bay in ’04) won the Cup. Many commentators have all but given it to them already. Now Phoenix has made a mess of things. But they and they alone have the chance to inject these playoffs with the bit of excitement they’ve been sorely lacking, and regain the club’s hard-won respectability tomorrow night. 37 Teams have come back from 2-0 historically; nobody has this year. Very few have when coughing up the first two at home. Can Phoenix find their inner groove, the carefree and outsider game that had them at cruising altitude these whole playoffs, and finally demonstrate that they are legit contenders and the Los Angeles Kings are, in fact, human? Or, do we have to sit through a game 4 which will be a mere coronation? The calls are louder than ever for individual Coyotes to step up to the plate. Can the team’s longest success drought of these playoffs end? For the first time, there’s a possibility that this column has reached it’s last question mark of the season.